Halo Self-flanged 6-Inch LED reflector in white flange color, features aluminum construction. This one-piece parabolic aluminum reflector offers cut-off for visually comfortable optic. 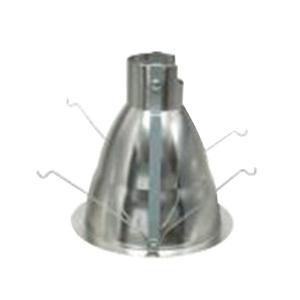 This reflector retains with two torsion springs that holds the flange tightly to the finished ceiling surface. It measures 7-1/2-Inch OD x 7-Inch. This reflector is suitable for use with PD6 housing.